A recently released study by the Pew Research Center proposes a connection between the rising cost of child care and the increase in stay-at-home moms. Using data from the U.S. Census Bureau’s annual “Who’s Minding the Kids” report, child care costs have jumped 70% between 1986 and 2011. The data changes the perception that mothers stay at home because they want to, or that their partner’s income is sufficient for the family’s needs. WECA Executive Director Ruth Schmidt recently spoke to the cost of care in a recent interview on WKOW with reporter Jennifer Kliese. This entry was posted in Uncategorized and tagged child care costs, Jennifer Kliese, Pew Research Center, Ruth Schmidt, US Census Bureau, WKOW. Bookmark the permalink. 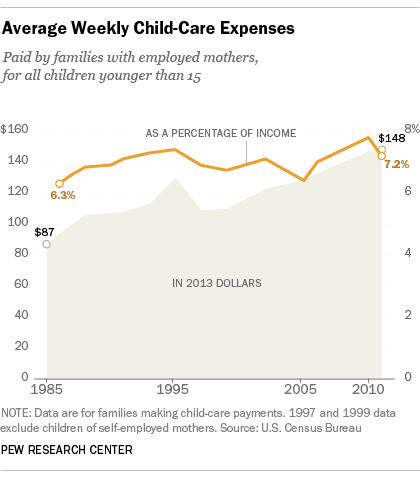 The cost of child care has risen because operating expenses have risen. Being the owner of a NAEYC accredited group child care center for 24 years I agree that child care staff deserve higher wages, unfortunately, tuitions cannot support the wages they deserve. I have been a child care provider for 16 years. I have a very hard time raising my rates because I realize the burden of day care costs to families. In fact, I have raised rates only twice in my career. What some people need to keep in mind is that providers must pay for insurance, training, licensing or certification, equipment, learning tools, curriculum, back ground checks, not to mention food costs not reimbursed by government programs. Provider/child ratios make it very hard to make a living wage. I believe in quality child care in which developmentally appropriate practices are being used but it is impossible to do this without an appropriate income. I love the children in my care, I try my best to provide the best environment possible within my means. Child care providers more often than not do not have health insurance, savings or retirement plans or paid vacation/sick days. We often work up to 60+ hours per week without overtime compensation. Something has got to give! I would like to see help from the state and/or local levels to help day care funding for providers and families. The cost of everything has risen over the last 25 years! The cost of gas in 1986 was $.93 per gallon it has risen 318% in 2011. The cost of a movie ticket was $3.71 which rose 121% to $8.20 in 2011. Don’t forget the median income in 1986 was $24,897 which rose 64% to $40, 925 in 2011. Even milk which is subsidized by the government went up 53% in 25 years. The unemployment rate was also the highest it has been in the last 25 years at 9.1% which probably contributed more to the number of moms staying home with their kids. The cost of childcare has gone up in line with the median income and cost of living over the 25-year span, it by no means “jumped”.